NASA’s Wide-field Infrared Survey Explorer, or WISE, is a little like the Vincent van Gogh of the infrared sky. Just like the famous Impressionist painter created beautiful images of nature through use of color and light, WISE has provided the world with picturesque images of the cosmos by representing infrared light through color. This image of the nebula NGC 2174, on the border of the Gemini and Orion constellations, is a perfect example. The colors in this image may look like brush strokes of paint but actually represent specific wavelengths of infrared light. Particles of interstellar dust are warmed by the star cluster in the center of the nebula, and glow in wavelengths of 12 and 22-microns, which WISE represents by the colors green and red. The blue and cyan (blue-green) stars scattered throughout the “canvas” of the image are hot compared to the dust, and emit light at 3.4 and 4.6 microns. Affectionately called the “Monkey nebula” by some, NGC2174 is a cloud of gas and dust that surrounds the star cluster NGC2175. As the star cluster heats up the nebula, the dust begins to glow in infrared light. Strong winds and radiation from the stars blow away the nearby material, creating a shell-like structure. NGC2174 was discovered in 1877 by French astronomer Jean Marie Stephan, who used an 80-centimeter reflecting telescope at the Observatoire de Marseille, France. Today, it is a favorite target for amateur astronomers because it can be seen in binoculars or a small telescope. Another nebula can be seen in the upper half of this image. In this case, the gas is hollowed out by a massive star named TYC 1326-964-1. The matter in between the stars in this nebula is named [GS55] 85, after the initials of the astronomers who first catalogued it in the 1950s. Several red-colored young stellar objects can be seen scattered throughout this nebula. 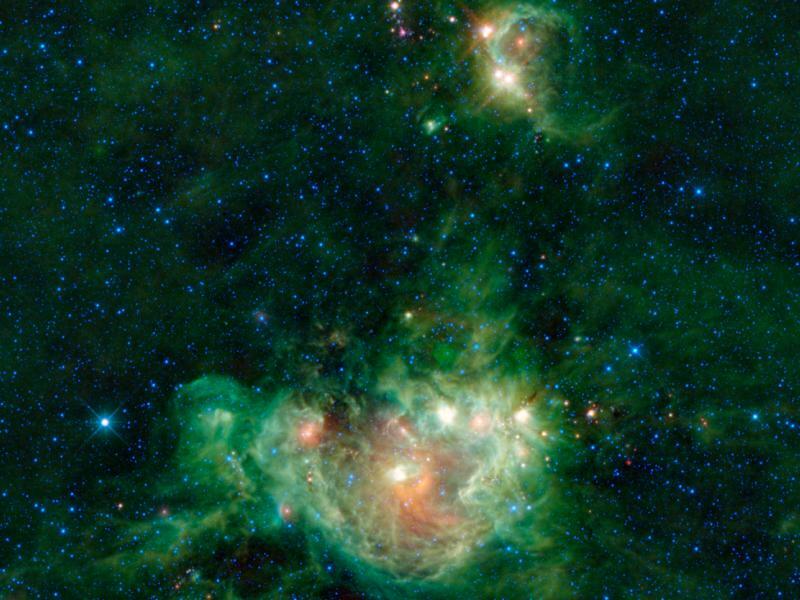 These are newly formed stars still enshrouded in a cloud of dust. Near the top and toward the left of the image lies a bright blue star known as HR2190, which is actually a red dwarf star. Red dwarfs are on the cooler and dimmer side for stars, so the relative brightness of HR2190 in the image means that it is much closer to us than the nebula.